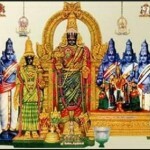 Tags: azhwar, madhurakavi azhwar, nammazhwar, thiruvaimozhi. Among the innumerable devotees of Lord Vishnu, 12 of them stand out. They were the ‘Azhwars’ who were bathed in unflinching devotion to the Lord and composed thousands of devotional verses on the Lord. A compilation of these verses is the famous Nalayira Divya Prabandham. Among the 12 Azhwars, one is unique because he was not a devotee of Lord Vishnu. Madhurakavi Azhwar, an epitome of Guru bhakti, was devoted only to his Acharya, Nammazhwar. Born in Tirukkolur, Tamil Nadu, in a pious brahmin family, Madhurakavi Azhwar had gone on a pilgrimage to north India, when he saw a glowing light while at Ayodhya. He followed the divine light in search of its source, and crossing hundreds of miles, was led to Tiruppulingudi in southern Tamil Nadu, to a tamarind tree that Nammazhwar had chosen as his home. Having thus seen Nammazhwar, Madhurakavi Azhwar, being a learned scholar, posed a question. Nammazhwar who constantly reveled in an ecstatic state of divine bliss that rendered him mute and motionless since birth, opened his mouth for the first time and answered. The Guru and the disciple had met! Since then Madhurakavi Azhwar dedicated his life to the service of his Master. But for him, we would not have the beautiful thousand verses composed by Nammazhwar today. For it is he who diligently scribed all the beautiful pearls of devotion that dropped down from the mouth of Nammazhwar when he was immersed deep in the love of the Lord. Madhurakavi Azhwar himself composed only 10 verses during his entire life, all of them on the greatness of his Acharya. These verses, starting with ‘kanninun chiruthaambu‘ also form part of the Nalayira Divya Prabandham. Madhurakavi Azhwar was born on the Chitra star of the Chitra month of the Hindu Calendar. This day falls on April 17 this year (2011). One Response to "The Unique Azhwar"
Wonderful to read about Madhurakavi Azhwar…Thanks Narayanan ji..Jai Gurunath! !